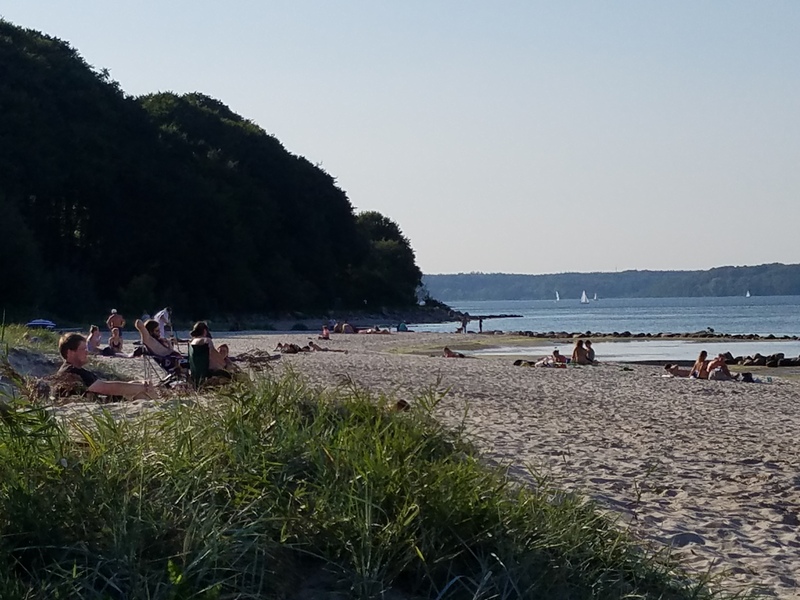 I just spent a week and a half in Flensburg, Germany. Flensburg is up in northern Germany, right near the border with Denmark. People hanging out at a cafe. This is around eleven in the morning. Every day, we’d see people strolling along the central shopping area, talking, sitting at an outdoor cafe with friends. I simply didn’t see the kind of stress written onto people’s faces like I see here in the US. I was told that the employers have done some sort of little trick to add onto the work week, but even so, it seems to me that people have more free time. I understand that wages are lower in Germany – around $20/hour for a skilled worker – at least in Flensburg. Rents seem to be about the same or a little lower, at least there. One huge difference is that there is a national health insurance, so workers don’t have to pay for that. In general, although the living standards aren’t quite as high – for instance it seems that workers wouldn’t live in quite as big a house or apartment as they would here – but you simply don’t see the extremes that you do here. Not as much poverty and very little homelessness, although I’m told that it is increasing a little bit. Beach right near town. This was taken around 4:30 in the afternoon. Dozens of young people, including work age people, hanging out. For one thing, they don’t have to take one or two hours to get to back and forth to work, so they have more free time after work. There’s been a lot in the news about the “Alternative for Germany” (AfD) party. This is a far right, anti-immigrant party that’s actually had riots and physically assaulted immigrants. But one recent survey showed that 75% of Germans think that immigration is positive. 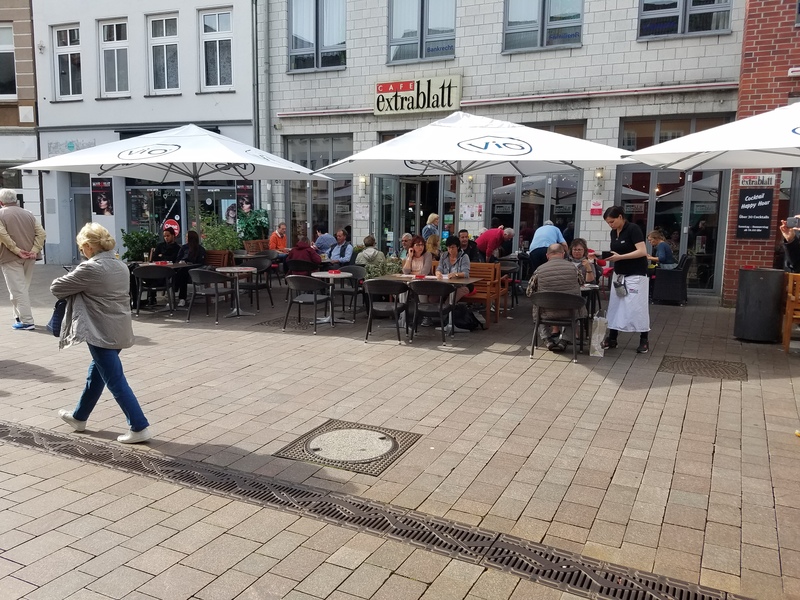 Being pretty remote, there aren’t a lot of immigrants in Flensburg, and one thing I did notice was that there didn’t seem to be a lot of mixing, you could call it. There was some, but it seemed to me that mainly the Mid East and African immigrant people seemed to be hanging out among themselves. Overall, in Flensburg, though, I didn’t have any impression of anti-immigrant feeling. I saw one graffiti on a wall and it said something about fascists out and support Palestinian rights. 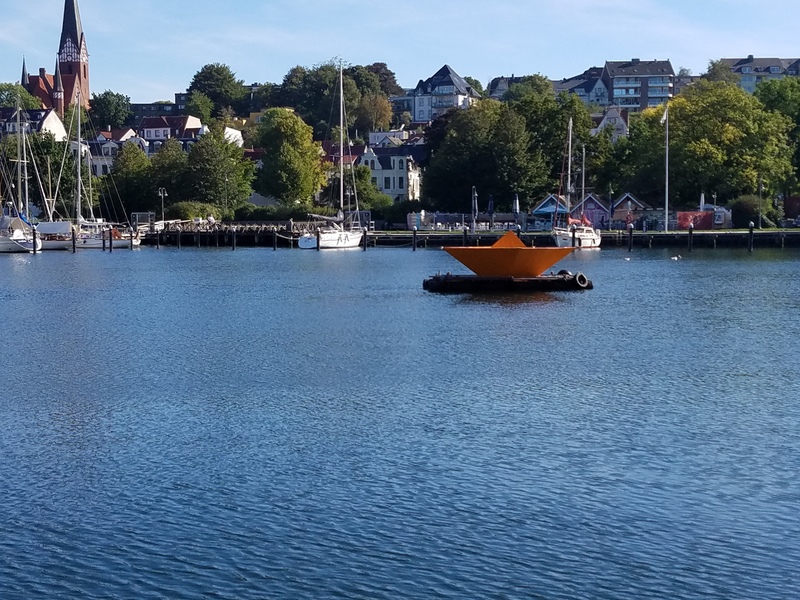 Below is a float that the City of Flensburg has in its harbor. It’s mean to be a boat, representing support for those on boats – in other words, people coming to Europe across the Mediterranean. A “boat” representing support for those crossing the Mediterranean on little boats. As for the roots of the anti-immigrant sentiment that does exist: In the US, some of it is due to economic competition. That’s not the case in Germany, I don’t think, because there seems to be full employment and rents aren’t that high. If there were a real, vibrant workers movement there, it could have played a huge and important role in this issue: It cold have organized for people to “adopt” a refugee family. Take them around, have a cultural exchange (from cooking to politics), and really help them integrate into German society. This would have enormously strengthened the working class movement and would have helped build direct links between German workers and those from Syria, Afghanistan, and elsewhere. 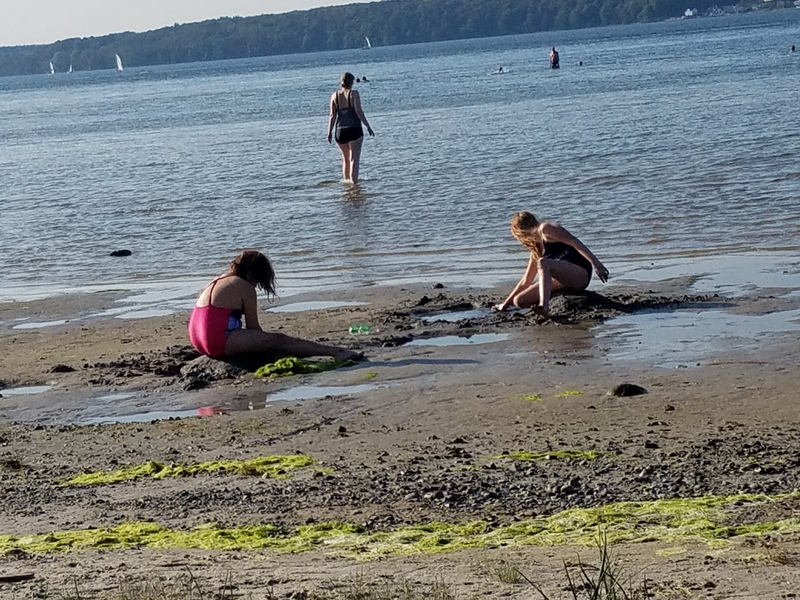 Kids playing at the beach after school. sounds of kids laughing, shouting and having fun. Another day, we took a short ferry ride – about an hour – from Flensburg to the next town and back. Around 2:30 or so, we passed by a group of kids clearly taking sailing lessons. From how far out they were, it was clear they’d been out there at least a half hour, probably more like an hour. In other words, when kids get out of school, they have the afternoon to do what they are supposed to be doing: exploring the world, having fun… in other words, being kids! The idea isn’t to keep their noses to the grindstone for hours and hours a day. Here’s a typical street scene. Note the direction of the green light, meaning that these pedestrians have the red light. 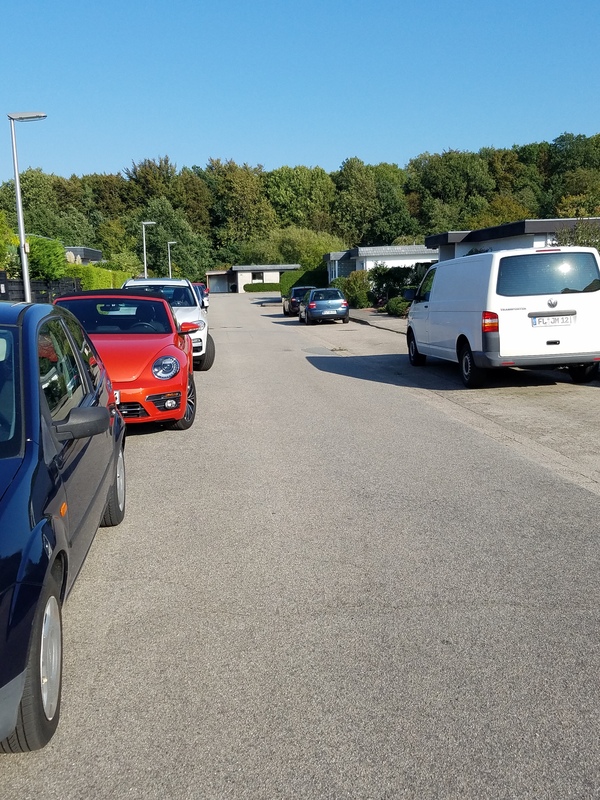 BUT… there’s no cars coming, so why wait? 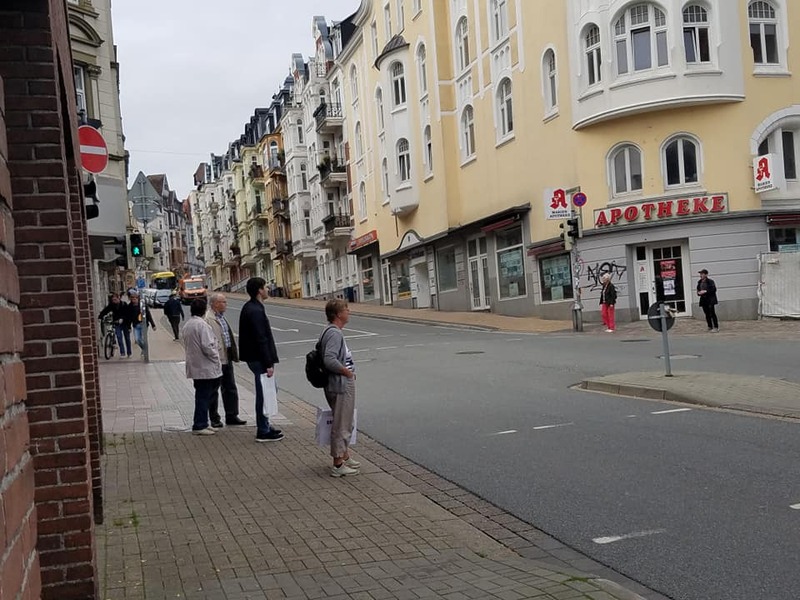 Here is a street in a typical working class neighborhood of Flensburg. One contrast with Oakland is that the streets aren’t all cracked and full of pot-holes. Also, no garbage in the street. Well written, John. On the subject of “square Germans”. I just had to remember last night when, after midnight, I drove home from fishing by car and signaled in the middle of nature at an intersection on the left. I had to smile myself. But John, you don’t know the German policemen who really love their job and often appear at incredible times in an incredible place out of nowhere and then you lose 20 €. I’ve already experienced that myself! Having had my bottom shaved in Philly, so often by cars – & bikes – so often, and being almost run over several times when ‘I had right of way’ – in Philadelphia… I prefer the way cars and bikes behave in Berlin to Philadelphia anyday. As for standard of living-wages – try factoring in healthcare costs/education/kindergarten/old-age pensions ….. But no doubt it is still a capitalist state.